The gloom and darkness of the 1980s and '90s are lifting in a veil of glorious new pop music  music that rejects the nihilism and narcissism of punk and grunge, music that actually celebrates beauty, exults in melody, that luxuriates in harmony. Another exhibit of the revival of beautiful music is Northern Ireland's Morph. 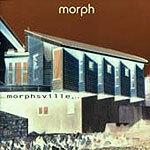 Morph's debut CD, "Morphsville," is an utterly luscious celebration of beautiful music. From the hook-laden melodies in nearly every song to the lush-pile harmonies and wall-of-sound arrangements, this is as accessible an album as you're going to hear. One supposes there is no contemporary Irish rock band uninfluenced by U2 or Van Morrision, any more than you could find an American band untouched by Chuck Berry or the Beach Boys. And so both those influences are here, along with similarities to the Cranberries and the Corrs. Other younger, hipper critics are comparing them to Coldplay. But here's the thing: Morph is its own animal. Lead singer Collie Stewart has a fully developed vocal style, his own sound. While its reminiscent of other successful singers, it's not a rip-off or imitation. The guitar players, Richard and Stephen Stewart, have their own thing, too  a dramatic, larger-than-life style that hearkens to Queen's Brian May with perhaps less flourish and touch more tasteful restraint. But mostly the magic of this CD comes down to their songs, which are all instantly familiar, like an old friend you've only just met. For the socially hypersensitive, it ought perhaps be pointed out that appreciating beauty and light does not mean a band is uncritical. Morph's songs feature smart, insightful lyrics that tackle serious subjects. They're just wrapped in a very decadent aural package.